As some of you may be aware, long standing member and current Control Line Secretary, Brian Lever, was nominated in 2009, for a BMFA Award. The citation stated that "Brian has, for over 25 years, consistently championed the cause of control line flying in particular and aeromodelling in general. He was the driving force throughout the 14 years of the Peterborough Cabbage Patch Nationals (CPN) and it was his vision in inventing, sponsoring and publicising events that built the CPN into, arguably, the biggest single day control line event in the world." In 1997 he took over the chairmanship of SAM 35 at a difficult time and successfully prevented a potential split within the organisation. As the current President of SAM 35, he was instrumental in achieving its successful incorporation as a Specialist Body of the BMFA. More recently he has been working with a local Grammar School in the BMFA Flight Challenge and his love of the hobby / sport is unabated. 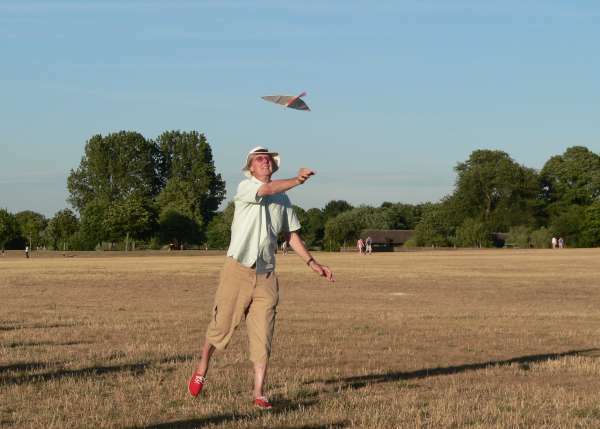 At the 2009 Free Flight Nationals he flew in three control line and 3 free flight events but, perhaps more importantly, he cajoled and enthused a number of other club members to take part. Brian Lever is an enthusiast for all branches of the hobby. He continues to nurture new competitions and to be heavily involved with the highly successful Peterborough Flying Aces free flight event (now in it's 14th year), SAM35 and it's annual Gala. I am sure that we all members at The Peterborough Model Flying Club are pleased to see this double recognition and proud that Brian is one of our members.